“Solo: A Star Wars Story” will premiere at the Cannes Film Festival on May 15, according to Deadline. The report is a bit of a surprise since the movie is a franchise blockbuster, which are rarely show at the festival, but there is precedent: “Star Wars: Episode III – Revenge of the Sith” was first shown at Cannes back in 2005. “Solo: A Star Wars Story” comes to theatres on May 25, but it’s reportedly heading to Cannes before then. According to Deadline, the latest “Star Wars” anthology film will premiere at the Cannes Film Festival on May 15, a little more than a week ahead of its theatrical release. The report is a surprising one since franchise and blockbuster films are rarely shown at the festival, which begins May 8 in Cannes, France, but “Star Wars: Episode III – Revenge of the Sith” premiered at Cannes back in 2005. Cannes did confirm on Thursday that “Everybody Knows,” starring Penelope Cruz and Javier Bardem, will open the festival. 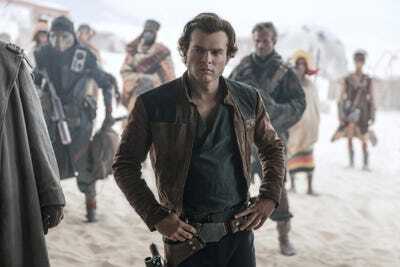 “Solo” was plagued with production troubles as its original directors, Phil Lord and Chris Miller, were fired for creative differences and replaced with veteran director Ron Howard. An anonymous actor who worked on the film also recently revealed that Lord and Miller would sometimes demand over 30 takes, and that production was smoother once Howard took over. Despite the troubles, “Solo: A Star Wars Story” stayed on course to open next month – it just looks like it will make a stop at Cannes first.